So many people are doing this that many of the larger retailers are messing with the codes on their products so that you can't directly compare. Many staff in smaller stores will actually challenge you if they see you taking pictures of a UPC code in order to check a price. Tough. Lower your prices if you don't like competition. I hadn't realized that I was doing this until I went into my phone today looking for pictures to post. 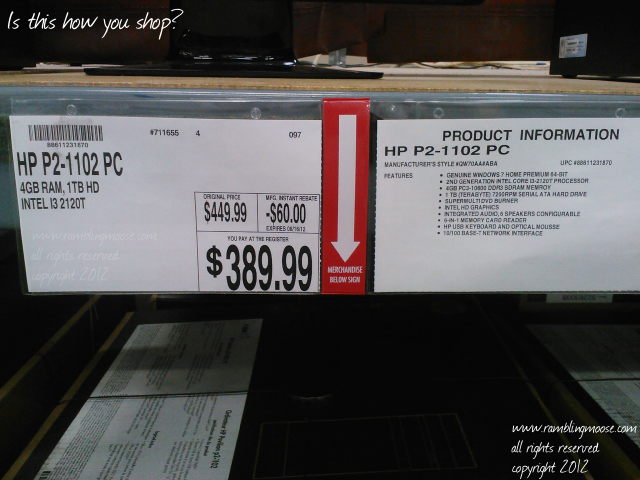 After six of my dog, I saw this rather bland picture of a price of a desktop computer at BJ's Wholesale. Not a very good one. A Desktop i3 Computer with these specs should be at least 40 dollars cheaper. I have a picture of a particular little bench from Ikea in my other phone, and on both phones there are apps that will scan your UPC bar code on the product's packaging, compare it against various lists and report back the lowest price. Both work, although 9 times out of 10, I am using my Android phone. In the case of this PC, I wanted to research it more at home. I had a feeling that a neighbor could use it, but we found a better deal... I hope. Think of it as Guerrilla Shopping. I knew things were changing when looking for a car changed from get ripped off in the store, to print out the comparable prices and bring with, then finally just quote the prices online. The same thing has happened for all sorts of items. Amazon.com exists to service the "Long Tail" theory of marketing. That is that while most folks will buy the same thing every day, there are some rare One Off purchases that you only do a few times and there aren't a whole lot of folks that can service your need for that product. You know, the idea that you just can't find that doodad in the store because the local shops don't have it? Need to find a Screen Protector for that camera phone? That's where you will probably find it even if it is a 2 year old device... which reminds me I never did put mine on my Android phone. As much as I try to shop locally, I have to admit, I can't afford to pay 25% more just to shop in a mall. This trend is even reflected in the tendency to large strip malls instead of enclosed malls since a strip mall doesn't have to run air conditioning or heating (what's that?) in the open areas. Lower operating costs mean lower consumer prices, and so on. These apps tie all that together. You're in the big box store, you have a product for $99.99. 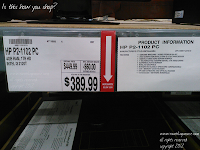 Take a picture and find out that some other big box store down the road has the same item for $79.99. Unfortunately for the mom and pop stores, they rarely come up lowest because they are trading on personal service. There are some things that the mom and pop absolutely do better than a big box store. Bye, I'm back in the car and rolling for a sweet $20 savings. It's changed and the Genie isn't going back in the bottle, even if he does occasionally end up in my camera phone. In a time of austerity, that $20 means a lot. Business to Business sales on the other hand don't fit this model very well where bakeries baked goods are always better than the same baked goods in a big box store. One size doesn't always fit all but more information makes for a better deal.